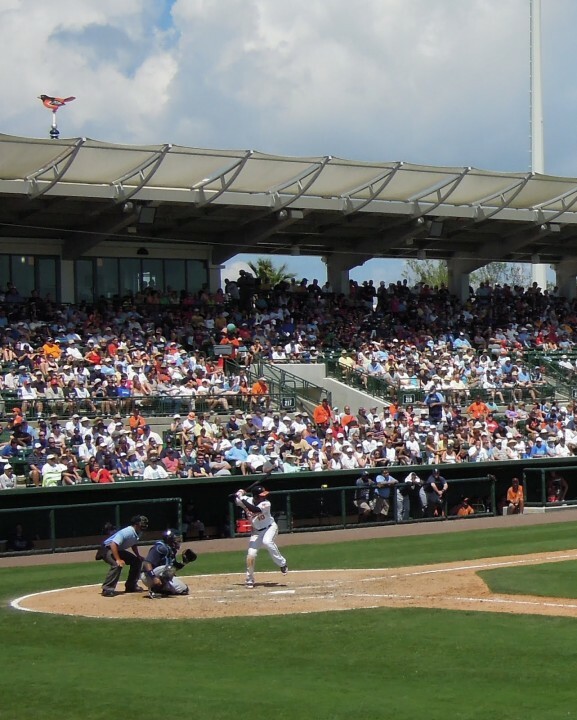 The Baltimore Orioles are inviting fans of all ages to celebrate the start of Spring Training by attending Sarasota Springfest, a free family-friendly event at Ed Smith Stadium on Saturday, Feb. 16. Along with watching Orioles pitchers and catchers practice on the backfields, fans may enjoy games and interactive activities in the stadium from 9 a.m. to 1 p.m., a news release says. The fourth annual Sarasota Springfest also will feature a question-and-answer session with Orioles outfielder Cedric Mullins at approximately 12:30 p.m., the release adds. “Mullins, a 13th round pick by the Orioles in the 2015 First-Year Player Draft, made his Major League debut in August of last season after successfully progressing through the minor league system,” the release explains. Additionally, fans once again will have opportunities to play catch on the Ed Smith Stadium field, take behind-the-scenes tours of the ballpark, and participate in a “Pitch for Charity” event to benefit Miracle League of Manasota, the release notes. “There’s no better way for fans to warm up for Spring Training than to attend our free Springfest,” said Greg Bader, the Orioles’ vice president for communications and marketing, in the release. Field conditions permitting, two sessions of “Have A Catch” will be offered on the main field of the stadium, at approximately 10 a.m. and 11:30 a.m., the release says. “Access is first-come, first-served, and participants must bring their own gloves and sign a liability waiver,” the release points out. Orioles event staff will provide stadium tours every 20 minutes beginning at 10 a.m., the release continues. Fans will see areas not usually open to the public, including the press box, World Series Suites, Home Plate Suite, Third Base Lounge and the visiting team’s clubhouse, the release says. “Pitch for Charity” is scheduled for approximately noon at the Left Field Pavilion. Fans may purchase balls, ranging in price from $3 to $10, at the event entrance, and then test their skills by pitching from the Pavilion into a target on the main field, the release explains. All proceeds will support Miracle League of Manasota, “an organization dedicated to providing an opportunity for every person to play baseball, regardless of their ability,” the release says. Fans also will be able to earn Orioles-themed prizes based on their pitching accuracy. Among the other features of the event will be corn hole games, a giant Connect Four, face painting and free souvenir photos provided by TapSnap, the release notes. Access to Springfest will be through the Left Field Gate, adjacent to the East Lot near the intersection of 12thStreet and Tuttle Avenue in Sarasota. Free parking will be provided in the East Lot. Guests under the age of 18 must be accompanied by an adult, the release points out. For more information, fans may visit Orioles.com/Springfest. On Saturday, Feb. 23, at 1:05 p.m., the Orioles will play their first of 17 home Spring Training games this year at Ed Smith Stadium, the release notes. They will face the Minnesota Twins.